Residents are able to select fresh fruits and vegetables, meats, canned goods, and much more. The second floor of Lakeview Pantry is committed to social services and features access to caseworkers to meet with clients to assess daily needs. 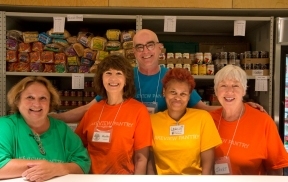 To learn more about Lakeview Pantry, visit lakeviewpantry.org. 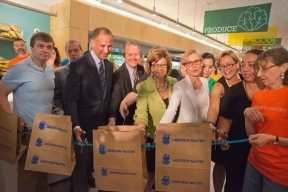 Lakeview Pantry cuts a ‘grocery bag’ ribbon to celebrate the grand opening of its new, permanent home. Pictured from left to right: U.S. Congressman Mike Quigley, Illinois Senate President John Cullerton, Lakeview Pantry Board President Dan Laytin, State Representative Sara Feigenholtz, Chicago’s First Lady Amy Rule, Greater Chicago Food Depository Executive Director and CEO Kate Maehr, and Lakeview Pantry clients and volunteers. 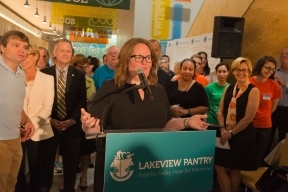 Lakeview Pantry Executive Director Kellie O’Connell welcomes elected officials pantry staff, volunteers and clients to the grand opening celebration of the pantry’s new 7,500 square foot building, located at 3945 N Sheridan Road. Lakeview Pantry is the largest food distribution center in Chicago, serving more than 7,000 households.